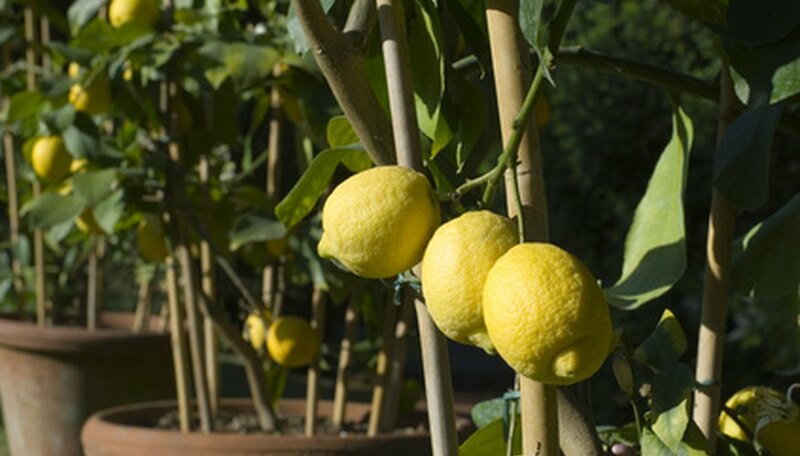 Lemon trees make excellent container plants, and they can be grown indoors if given proper care. There are many varieties of lemon trees that can be cultivated as dwarf trees, including the popular and hardy Meyer lemon, which thrive as indoor plants according to an article published by the Emmitsburg News-Journal. These desirable citrus trees provide year-round interest in the form of fragrant spring flowers, glossy, evergreen leaves and delicious lemons. Indoor lemon trees grow best in daytime temperatures around 70 degrees F, with a drop of about 10 to 15 degrees at night. If the temperatures remain consistently cool (below 55 degrees F), the tree will enter a dormant state and perhaps drop its leaves. Indoor lemon trees should be exposed to at least six hours of sunlight per day, according to the Emmitsburg News-Journal. Eight to 12 hours is even better, as fruit trees in general need a lot of sun. Bright but indirect sunlight is best, so place your tree near a southern-facing window. Rotate the tree weekly to make sure all sides are exposed to the sunlight. Use a sandy, slightly-acidic planting medium for your indoor lemon tree. Use a container that has drainage holes and empty the water-catch tray immediately after the plant stops draining, so the tree doesn't get "wet feet." Overly-wet soil can lead to root rot, a fungal disease. Water the tree often enough so that the soil is consistently moist, but not soggy or waterlogged. Lemon trees have a growing season that lasts from late winter through June, and then again in August. Fertilizer the tree with an acidic, high-nitrogen fertilizer (20-10-10) during this time. Apply the fertilizer every time you water according to the directions on the label. Indoor home environments usually have drier air than citrus trees prefer. To add humidity to the air, place your lemon tree on a tray filled with pebbles that are barely covered with water. Rest the potted tree on the pebbles.